Followers of Islam Rise-Up Against Your Oppressors! Defend Your Land and Free It From Your Enemies! Mount Your Horses and Ride Toward Enlightenment! Following the Russian Communist Revolution of 1917, the bourgeois forces of the West (together with Imperial Japan), launched an invasion of the fledgling Communist State that became known as the Russian Civil War (1918-1921). The USA and Europe wanted to return Russia to a backward feudal system that they could easily control, but the newly formed Red Army countered this threat and eventually drove the capitalists out of Russia and the Soviet Union. 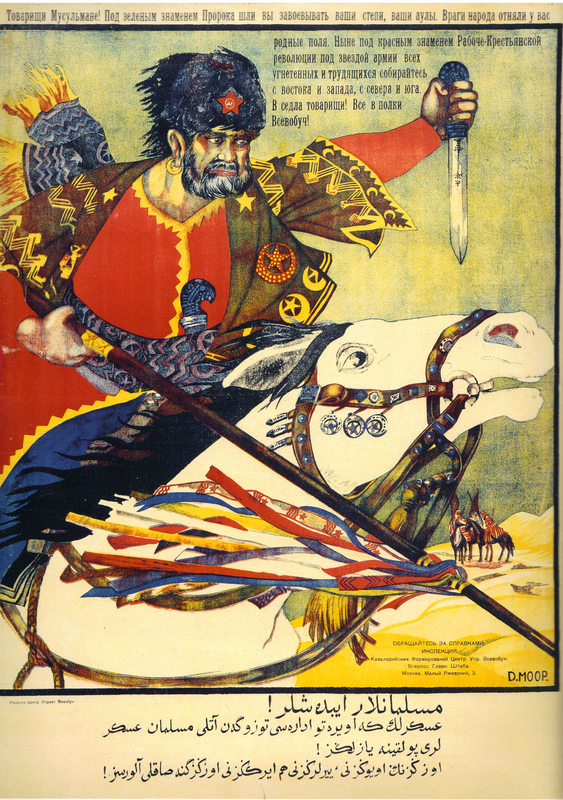 This poster (printed in Russian and Turkic Tartar) is calling upon Islamic horsemen to join the Red Cavalry and defend the Communist Revolution by driving the capitalists out from their homelands.